Central Texas includes the famed "Hill Country", rich cultural and historic sites, the state's capitol in Austin, and one of the world's largest artesian aquifers. TPL's earlier work in and near San Antonio continues as a part of our Edwards Aquifer Protection Program, which protects habitat for endangered species, provides close-to-home recreation opportunities, and protects water quality for nearly two million people. 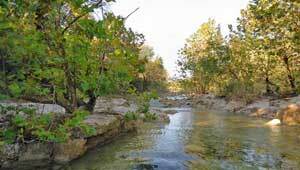 Our historic conservation work with several wildlife refuges and preserves in and near Austin continue as part of our Balcones Conservation Program, including work in the Balcones Canyonlands National Wildlife Refuge and the Barton Creek Wilderness Park. With the projected growth of the San Antonio-Austin corridor, TPL is poised to engage within the urban framework of central Texas cities to assure park and playground opportunities in under-served and park-poor communities.